Netflix's revenue, subscriber count, and operating income are all rising rapidly. But the company's persistently negative free cash flow is bad news for long-term investors. Last Monday, Netflix (NASDAQ:NFLX) released a stellar first quarter earnings report. The streaming video pioneer beat its forecast for nearly every major reporting metric, continuing its strong growth trajectory. Netflix even managed to reduce its rate of cash burn last quarter. Nevertheless, management is sticking to its forecast that free cash flow will fall even further into negative territory in the next few quarters -- and won't turn positive for several years. If that projection is accurate, it's hard to see how Netflix will be able to live up to its valuation of nearly $150 billion. Netflix added 7.41 million streaming subscribers in the first quarter, easily beating its forecast of 6.35 million net additions. This was also up dramatically on a year-over-year basis: Netflix only added 4.95 million net new subscribers in Q1 2017. In the U.S. market specifically, Netflix increased its subscriber base by 1.96 million, reaching 56.71 million total domestic memberships. Back in 2012, CEO Reed Hastings estimated that Netflix could eventually reach 60 million-90 million subscribers in the U.S. The company is on track to hit the low end of that range later this year -- and it continues to grow its domestic user base at a steady pace. Netflix's subscriber growth has shown no signs of slowing thus far. Image source: Netflix. Netflix's rapid subscriber growth and recent price increases helped it grow revenue by more than 40% last quarter, while earnings per share surged 60% to $0.64. Netflix still burned $287 million of cash during the quarter, but that was its best free cash flow result since Q2 2016. The company's second quarter forecast was pretty favorable, as well. Netflix expects to add another 6.2 million net new subscribers, keeping its revenue growth rate above 40% and driving a more than fivefold year-over-year increase in EPS. Despite the company's big first quarter earnings beat -- including a solid improvement in free cash flow -- and its strong second quarter guidance, Netflix reiterated its forecast for cash burn of $3 billion to $4 billion in 2018. This implies that the company will burn about $1 billion per quarter for the rest of the year. Last quarter's reduction in cash burn was driven by favorable timing of payments for producing original content, according to management. Going forward, cash content costs are set to increase significantly. Additionally, Netflix is in the midst of ramping up its marketing activity in order to get the word out about its new shows and thus attract additional subscribers. As a result, cash burn will accelerate in the short term. In fact, management expects free cash flow to remain negative for several more years. Meanwhile, credit rating agency Moody's recently projected that Netflix will turn cash-positive in 2022. The bullish perspective is that Netflix's cash-intensive investments in content and its increased marketing budget are justified by its stellar subscriber growth. According to this line of thinking, negative free cash flow is just an artifact of the timing of content payments, and Netflix's double-digit operating margin proves that its strategy is succeeding. Mr. Market certainly seems to accept this explanation. However, it's hard to see how Netflix will live up to its $150 billion valuation if free cash flow remains negative until 2022. Earlier this month, respected valuation expert Aswath Damodaran estimated that Netflix stock might be worth just $173: barely more than half of the current stock price. This isn't because he thinks Netflix's growth is about to peter out: Damodaran's base case assumes that Netflix will have nearly 400 million subscribers a decade from now. Instead, the problem is twofold. First, current Netflix bulls seem to be underestimating the value drag from constantly rising costs. Second, bulls may not be fully accounting for the impact of time on present value. Cash flow expected to come far in the future is worth significantly less than the same amount of cash flow today. Netflix's revenue is highly correlated with cash inflows. Analysts currently expect revenue to surpass $20 billion next year. Revenue could be closing in on $30 billion by 2021, assuming a modest slowdown in Netflix's percentage growth rate. Based on Netflix's rough guidance that free cash flow would just be turning positive around 2021 or 2022, it appears that annual cash spending is projected to reach roughly $30 billion by then. Even if spending growth decelerates thereafter, it's unlikely to go to zero. Thus, Netflix might need to double its revenue again (to around $60 billion) just to reach $10 billion of annual free cash flow. For comparison, International Business Machines (NYSE:IBM) has a slightly lower market cap than Netflix today and has produced at least $10 billion of cash flow every year for more than a decade. Data source: IBM Free Cash Flow vs, Market Cap (TTM), by YCharts. Netflix would need to increase its subscriber base by 150% and its average revenue per user by 50% to reach $60 billion in annual revenue. It might be able to get there by the mid-to-late 2020s. 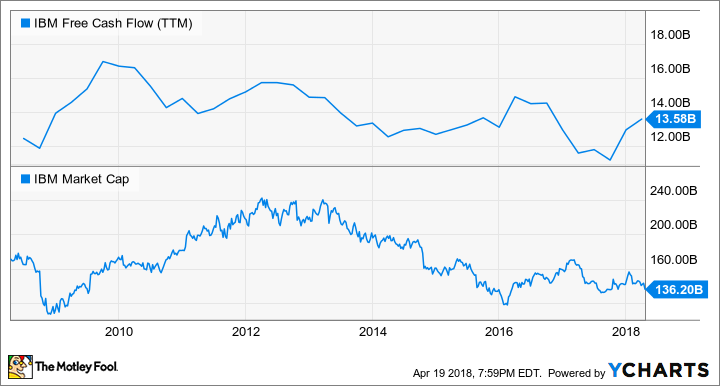 However, Netflix would need to maintain a high rate of growth beyond that point to be a better investment than lowly IBM, which isn't growing much, but is still likely to continue churning out annual free cash flow of more than $10 billion for the foreseeable future. In short, Netflix's valuation has gotten to be so high that the only way for investors to win in the long run is if the company can continue its rapid growth without investing so much money in additional content and marketing. Unfortunately, Netflix's cash flow guidance indicates that the company's high growth rate is still coming at a heavy cost.